The New Custodians of the State uses contemporary France to reassess sociological theories of political and policymaking elites. 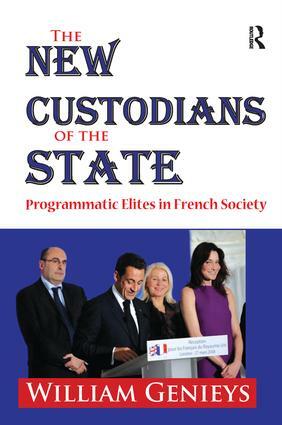 Based on detailed case studies drawn from social policy and national defense sectors, it concludes that a new type of sectorally-based elite has risen to prominence in France since the 1980s. Genieys suggests that programmatic elites found in specific policy sectors, made up of individuals linked both by common career paths and the resulting skills and expertise, should be seen as new guardians of state power.Like their technocratic predecessors, programmatic elites maintain a high degree of independence with respect to electoral politics and to civil society; like them, they share an ideological commitment to protect and expand the role of the state in French society. Unlike them, however, these new guardians of the state are structured around specific policy programs and limited in scope to a given sector. Competition among programmatic elites at the highest levels of the state emerges as the chief driving force behind innovation for social change.The New Custodians of the State introduces programmatic elites both as real-world actors and as an analytic category and highlights the limits of elite power by analyzing the defeat of efforts by the French Ministry of Defense. This book presents a thought-provoking critical case study that suggests that models presenting either a single unified state elite or those that herald or decry the demise of the state require modification. The work will be of interest to students and scholars of France, and its society and government as well as anyone interested in the policymaking process in other countries with respect to domestic policy or national defense. Choosing Social Welfare: Why Do Elites Specialize?